The Builders Collection from Smartstone offers architects, designers, specifiers and homeowners some of the most cost-effective choices in engineered stone. In addition to a broad selection of design options, the Builders Collection offers significant cost advantages. 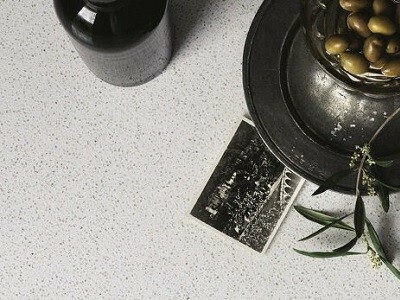 Smartstone’s engineered stone slabs are sized to optimise most standard benchtop combinations. The large slab size of 3000mm x 1500mm, for instance, reduces the total number of slabs required, minimises wastage and achieves greater cost efficiency. Some of the advantages of Smartstone’s large engineered stone slabs include greater design options and flexibility at no added cost; measureable cost savings; superior performance with stain, chip and heat resistance; and no sealing required. Smartstone’s engineered stone comes with a 15-year limited warranty. The Builders Collection includes 11 unique colours: Almendra, Arcadia, Astral, Gelsomino, Marengo, Naxos, Nero Astral, Nombre, Santorini, Theron and Triton.